The Houston Independent School District has received 14 National School Public Relations Association (NSPRA) awards, including five Golden Achievement Awards. 2017 HISD State of the Schools communications campaign, which included a dedicated website, invitation, program, and other materials. Listen and Learn Tour to introduce new HISD Superintendent Richard Carranza to the community, complete with branding, flyers, online survey, and signage – as well as a live “virtual” town hall meeting streamed on district’s website, social media, and TV channel. Family-Friendly Schools Certification, including a video, branding materials, and a dedicated website. Social Media Scorecard to provide schools with feedback on their social media channels and school websites. The Communications team created a rubric for grading and provided the feedback in customized reports for each school, as well as resources and best practices. 2016 Educators of the Year, including branding for the superhero-themed event, signage, and a social media campaign. This entry was posted in Achievement/Recognition, Uncategorized and tagged awards, Communications Department, National School Public Relations Association, NSPRA, recognition on June 26, 2017 by HISD Communications. The Houston Independent School District Police Department and a team of assessors from the Commission on Accreditation for Law Enforcement Agencies will host a public forum next week as part of the department’s re-accreditation process. It has been 13 years since the department first achieved accreditation, becoming the only school district police department in the nation to achieve such a feat. This summer, the department is seeking its fourth renewal of the designation, and they need your input. This entry was posted in Elementary Schools, High Schools, News, Uncategorized, Your Voice on July 7, 2016 by HISD Communications. HISD staff collaborated with leaders in business and post-secondary education last week to create a graduate profile that reflects expectations the district wants all high school graduates to meet in order to be successful in college, career, and life — and the public and board of trustees will soon have a chance to weigh-in on this important benchmark. “We want to make sure that our graduates leave with skills that are required to be successful in colleges and careers of the 21st century,” said Assistant Superintendent for Linked Learning Adam Stephens. This entry was posted in Uncategorized and tagged graduate, linked learning, student on July 15, 2014 by HISD Communications. Welcome to HISD Blogs Sites. This is your first post. Edit or delete it, then start blogging! This entry was posted in Uncategorized on April 18, 2014 by HISD Communications. The HISD Board of Education on Thursday voted to table indefinitely an agenda item to cancel the consolidation of Dodson Elementary with Blackshear, the Rusk School and Lantrip elementary schools. The 5-3 vote comes after much debate on the topic and a move by board members who brought the item back to the agenda late last week. Trustee Paula Harris was absent from the meeting. Last month the board voted to repurpose Jones High School into a specialized Futures Academy. Trustees also voted 5 to 4 to close Dodson Elementary. The Board of Education did not vote on the administration’s proposal to increase funding per-student level by $35 for the upcoming school year. It will appear on next month’s agenda following additional board workshops on the subject. This entry was posted in Elementary Schools, Uncategorized and tagged Blackshear ES, Dodson ES on April 10, 2014 by HISD Communications. HISD eighth-graders choosing high schools and their career and education pathways now have a simple, one-stop way to do that on the district’s “Plan Your Path” website. A chart showing paths and “endorsements” at each campus is now online at www.houstonisd.org/planyourpath. The new, personalized learning system requires next year’s entering ninth-graders – the class of 2018 – to work with their families and counselors to create a Personal Graduation Plan and customize it with endorsements and a pathway that will reflect their career interests and goals for additional education or training beyond high school. When it comes to endorsements, HISD students have plenty of high school choices. Of the 43 campuses required to operate under the new plan, 26 are offering all five endorsements, and 12 are offering four. This entry was posted in High Schools, Uncategorized and tagged endorsements, HB 5, Plan Your Path on April 10, 2014 by HISD Communications. Thirty-three of Houston ISD’s 44 high schools are on the prestigious Washington Post’s list of America’s Most Challenging High Schools. The rankings of 2,050 most rigorous high schools nationwide were released this week. The rankings are based on the number of Advanced Placement, International Baccalaureate and Advanced International Certificate of Education tests given at a school each year divided by the number of seniors who graduated that year. HISD’s strong showing in the Washington Post rankings are the result of a 2009 decision by the Board of Education to boost the number of AP course offerings in all schools, and to waive the AP exam fees for all students in those courses. This entry was posted in Uncategorized on April 10, 2014 by HISD Communications. A Waltrip High School senior basketball player has received a big honor – he’s been selected to play in the Houston Area Basketball Coaches Association All-Star game. Nathan Washington has been a varsity starter for three years and will continue his basketball career at Grandview College in Des Moines, Iowa. In an interview with The Leader News earlier this year, he said he plans to study criminal justice or kinesiology. Waltrip has been previously been represented in the all-star game three times, including by Washington’s older brother, Milton. Milton Washington now plays basketball at the U.S. Military Academy at West Point. The game will be held at Phillips Field House, 2902 Dabney Dr. in Pasadena, on May 8. The time has not been set yet. 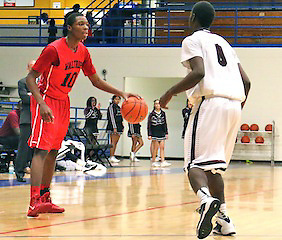 This entry was posted in Athletics, High Schools, Uncategorized and tagged basketball, Waltrip on April 10, 2014 by HISD Communications. Independent investigators hired by the Houston Independent School District have released a report outlining their findings regarding charges against test administrators at Charles Atherton Elementary School who have been under investigation. The report implicates three Atherton teachers of testing improprieties on the spring 2013 State of Texas Assessments of Academic Readiness (STAAR). This entry was posted in Elementary Schools, Uncategorized and tagged Atherton ES on April 9, 2014 by HISD Communications.